The Spiraling Reveries of Sleep In. Introduce yourself, tell me what you do in Sleep In., and how long the band has been together. Hey, my name is Tom Fowler and I’m the singer in Sleep In. The band has been together for a little over 5 years and I have been a part of the group for 4 years now. We are based out of Philly/South Jersey with some members living in either. The music scene here in both regions is vibrant and thriving. It’s a very big but tight knit family of truly amazing bands. There is a huge diversity of music in this area which always keeps home shows super fun. Is there is any overall story or concept behind the album title The Stars On Your Ceiling? It’s something I had growing up haha. The little plastic stars that glow in the dark. I had them littered all over my room. I’d just stare at them at night when I couldn’t sleep pretty much up until the time I moved out of my parents place. But as I grew older I sort of found it kind of funny and metaphoric. It felt so odd that I would look at these plastic stars when just beyond the roof there’s a whole sky. And it started to awaken me in my actual life. At the time I was fairly stagnant with music. I was in a toxic relationship. You know…the works haha. But it wasn’t all bad. Most of these songs are written about that particular time in my life. Rest assured I am in a much better state of mind these days. Select two songs from The Stars On Your Ceiling and what inspired the lyrics. Deena – This song is about my dog who I had to put down a short while ago. She was very integral to my sanity for quite some years. I got her at a pretty odd time in my life and she was the only real constant in my life at that time. This Old House – This one is about the house I moved out of my parents into. It’s had its ups and downs. But I can safely say I grew into an adult under its roof. (Some will argue that still hasn’t happened) It’s seen so many people and long nights. From friends, to bands crashing, and some strangers that became my friends. What could one expect from a live Sleep In. show? We like to bring a lot of energy to our live show. That and a half hour of tuning, extraordinarily awkward stage banter, and sweat. Oh, and then I make the crowd “give it up for Joe Franks”. He’s our guitarist and an all-around fantastic individual. He deserves it. How have the shows with Cabana Wear been going and what have been some of the highlights? My goodness… Where do I start? So both bands are from the same set of towns. We’ve all known each other for quite some time so it’s a great crew to be traveling with. The shows have been super fun. Yellowhouse in Richmond is always a great show. We went to Gwar Bar, which is in fact as fantastic as you could imagine. And in D.C. we ate way too many tacos. Has Sleep In. ever played in the Los Angeles/Orange County area or plan to do so in the future? We have not yet made it to the west coast, but we are very much eager and willing to. 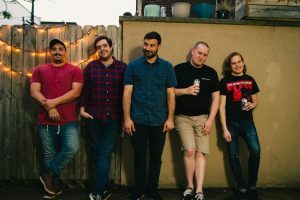 What was it like playing the 10 Year Anniversary Show with Cute Is What We Aim For and did you get to hang out with them at all? It was amazing. Union Transfer is my personal favorite venue in the city. The staff there is incredible, the sound is amazing. And the crowd seemed super into it. So playing there was an honor. Yeah we did get to hang out with them a little. And they were all super nice guys. If Sleep In. could open for any band either now or from the past, who would it be and why? VAN HALEN. Next question please. When you look back on your debut recording Settling, what do you think if it now? Well, Settling had a different singer. He left shortly after the album was released. So my reflection on this album may be a little biased. I loved this album when the guys sent it to me. I absolutely love their old singer’s voice. Even after performing these songs for quite a while I still find myself putting it on. It has truly stood the test of time for me. What’s up next for Sleep In.? Hoping to have a more extensive tour lined up for late summer/early fall, more writing, maybe another video or two for the record. Just generally trying to keep as busy and get as much content out there as we can. LIONS LIONS add more tour dates!